Bestinet: Who Are The Third Party Operators? Bestinet Sdn Bhd (Bestinet) is very much in the news lately. It was incorporated on 17-11-2008. Since then its directors and shareholders may have changed many times over like Ultra Kirana Sdn Bhd, the king of visa processing company in China and other countries, HERE & HERE. The scandal relating to visa processing fees by certain company broke into the open in Nepal recently. Please read “Politicians and recruiters in Nepal and Malaysia collude to loot poor Nepali migrant workers”. On 31-7-2018 Bestinet CEO Ismail Mohd Noor and director, Mr V Rathakrishnan in a press conference said amongst other things: “In source countries, Ismail said there were four processes which foreign workers needed to go through, namely biometric checking; health screenings; receiving and handling of a worker’s passport for calling visa; and, system and data entry for calling visa. We are only one of four service providers. We only handle the health screenings for which the home ministry allows us to collect RM100.” Please read HERE. Bestinet Claims Its FWCMS Provide End to End Management Solution For Migrant Workers – Is It?? Bestinet has claimed that FWCMS is the first system in the world offering single unified, integrated and holistic platform ensuring public security, public health, regulatory compliance and protection for migrant workers. If what it has claimed to be true then how could Bestinet two officials said that it is doing only the “Health Screenings”. Is that so? “The Foreign Workers Centralised Management System (FWCMS) is a multi touch-point system, involving a full-fledged web-based online management system backed by a secure data processing management infrastructure developed for the Government of Malaysia. The proprietary of the said system is designed as an end-to-end migrant workers managementsolution that is efficient, highly secure, and is designed to enable the multiple categories of user involved to easily utilise and manage their respective process. The system takes the whole process of recruiting, managing, monitoring and reporting of migrant workers online, in a paperless environment.” Please read HERE. In view of what has been stated in its website, that FCWS is designed as an end-end migrant workers management solution. This seems to give an impression that it is providing the migrant workers “an end-end” management solution that is to say all the four processes are carried out by Bestinet. Bestinet official saws it fit to say that it is providing only one of the four services that is to say “Health Screenings”. Bestinet charges RM100 for the single module “Health Screening”. It was supposed to charge each migrant worker for all the four services at not more than RM180. Why was this not done? It seems that each of the migrant worker has to pay more than RM400 to get a visa to enter Malaysia. The “special fees” collected by certain parties may be more than RM500 million per year. It is a lost to Malaysian Government. If Bestinet refuses to come clean to state who are the “Third party Operators”, yours truly calls upon the Director General of Immigration, Yg Bhg Datuk Mustafa Ali and/or Kementerian Dalam Negeri to investigate who are the “Third Party” operators for the three remaining services. 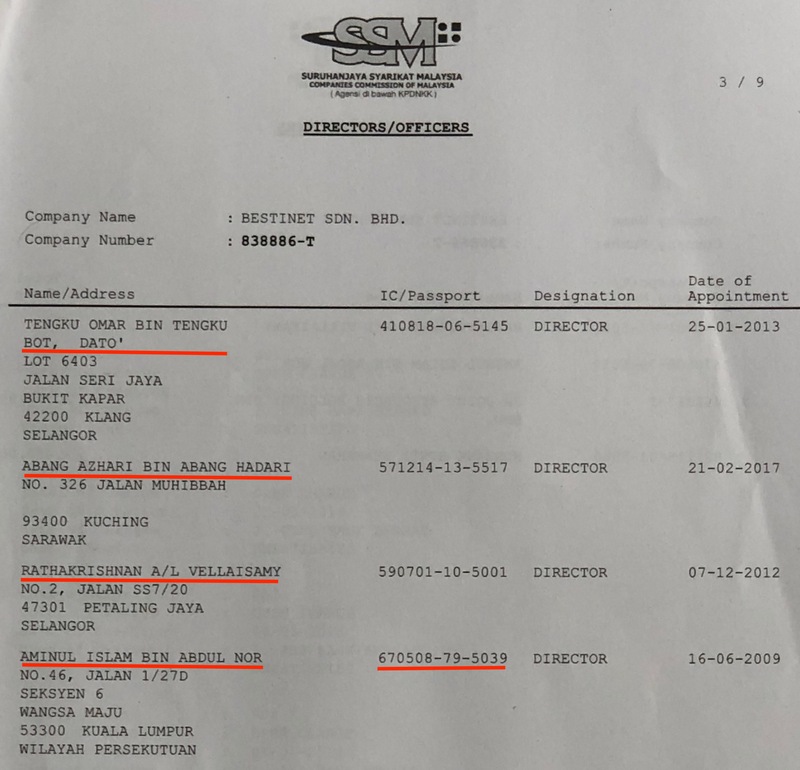 Yours truly had named three companies, S5 System Sdn Bhd (provides “immigration securities clearance”), Ultra Kirana Sdn Bhd (provide Visa Luar Negara “VLN” service) and Profound Radiance Sdn Bhd (provides One Stop Centre in Bangladesh), which were handpicked by Kementerian Dalam Negeri (KDN). Please see its letter dated 6 November 2014 in HERE. Previous Auditor-General & MACC: Why TM Loves Direct-Nego Contracts?